5 stars of bloody, brutal brilliance. 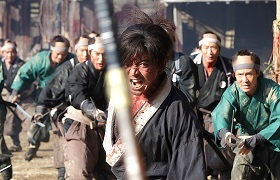 Blade of the Immortal is based on the manga of the same name by Hiroaki Samura and is the 100th feature from renowned director Takashi Miike (Audition, The Happiness of the Katakuris). With it’s breathtaking and beautifully filmed action sequences it is set to become one of his most revered films. 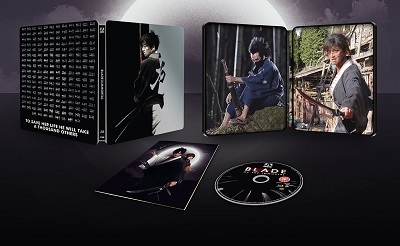 Manji (Takuya Kimura – Space Battleship Yamato, Hero) is a highly skilled samurai, exiled for killing his commander and now on the run with his sister Machi (Hana Sugisaki – When Marnie was There, Her Love Boils Bathwater). She has gone mad with grief following the death of her husband at Manji’s hands and he feels he must look after her. His life is changed forever when a group of bounty hunters catch up with him and brutally murder Machi. In a rage he slaughters every last one of them, losing his eye and hand in the process. 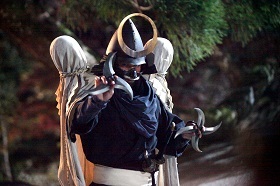 A crone, Yaobikuni (Yôko Yamamoto – Where Florence Sleeps) appears to him and denies his request that she kill him, instead giving him sacred blood worms which heal his wounds and curse him with immortality. Fifty years later and trouble has started in the area. A group calling themselves the Itto-Ryu are waging a war against the local dojos, wiping them out one by one. Their leader Anotsu Kagehisa (Sôta Fukushi – Library Wars, As the Gods Will) wants to unite all of them under one banner, using any fighting styles or weapons. One day however, he picks on the wrong dojo. The daughter of the owner who he kills, Rin (Hana Sugisaki) swears to avenge her parents and to that end she turns to Manji for help, starting a chain of events which will change both of them immeasurably. Blade of the Immortal is a visually stunning piece, with amazing fight sequences. From the brutal black and white battle which starts the film, right through to the glorious technicolour final fights it is action packed and blood soaked. It’s a really good story and very well acted too and the sword fighting is nothing short of spectacular. It is fully deserving of its 18 certificate and is most certainly not for the faint hearted, with blood and body parts everywhere, but it is most certainly worth a watch if you don’t mind that sort of thing. With loads of special features this one is well worth adding to your collection. 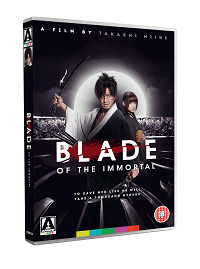 Blade of the Immortal is available to buy now on DVD, Blu-ray and Limited Edition Steelbook.